The top part of a faience pendant (the lower part is missing). 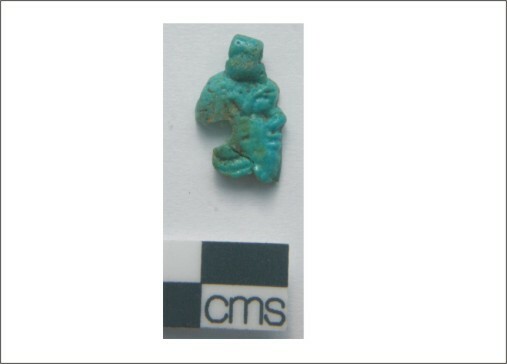 This item comes from Amarna and was donated to us by the British Museum. It came with other items from the EES excavations at Amarna. The figure wears a heavy collar. It was at first catalogued as a head of a captive and then later as a head of Bes. Both amulets of Bes heads and the heads of captives have been found at Amarna. In addition, some depictions of Bes from Amarna seem to have heads which look like Syrian captives (Stevens 2006, 32 fig. 11.2.2 no.30/784). An item described as a Bes head in the excavation report (Frankfort and Pendlebury 1933, 58) is described as a Syrian in the Amarna database (see further reading). A very similar head can be seen in Frankfort and Pendlebury (1933, 30, pl. XXIX, 1). That one is clearly Bes. There is another illustrated in full body, and holding his tail in typical Bes pose in Peet and Woolley (1923 pl. XIII.2) which comes from the Main City. In the Amarna Period there appear to have been variations on how Bes was depicted. Peet, T.E. and Woolley, C.L. 1923. The City of Akhenaten I. Excavations of 1921 and 1922 at El-Amarneh. London: The Egypt Exploration Society. Frankfort, H. and Pendlebury, J.D.S. 1933. The City of Akhenaten Part II. The North Suburbs and Desert Altars. The Excavations at Tell el-Amarna During the Seasons 1926-1932. London: Egypt Exploration Society. Stevens, A., 2006. Private Religion at Amarna. BAR International Series 1587. The Material Evidence. Oxford: Archeopress.